Natalie Willmschen is a senior Resident Assistant at Appalachian State University from Raleigh, NC. Natalie is studying Sustainable Development and loves sloths and being a good friend to others. See more of Natalie’s writing at http://simplyynat.weebly.com/. This past week I have been participating in my second Resident Assistant training, which can be long and sometimes taxing work. We are trained in a variety of things that allow us to be the frontline responders and resources for college students living on campus, which involves us sitting through long presentations all day long for two weeks while we also prepare our buildings for the arrival of students. Today I spent nearly my entire day working on putting up bulletin boards, one of the more well-known tasks that RA’s have to complete. At Appalachian, we use these bulletin boards as a primary tool for implementing the Residential Learning Plan (RLP), a new way of approaching life in a residence hall that looks at how learning can happen outside of the classroom. One of the things that the RLP spends a lot of time focusing on is reflection on an individual’s identity, specifically how the “Big 8” identities impact how we perceive ourselves, the communities we involve ourselves in, and how we interact with others. Those big 8 identities are race, ethnicity, sexual orientation, gender, socio-economic status, age, religion, and ability. We are also trained in how to have conversations with people through the “sustained dialogue” method which allows us to approach bias and identity related incidents and interact with people who have controversial or differing opinions. Today, as I tried to decompress from the heaviness of RA training and the exhausting day of bulletin board making, I sat down with my small pineapple pizza and put on Finding Dory and then Lilo and Stitch (no shame that I got through both these movies). This was when I checked social media for the first time of the day. My decompressing quickly changed into feelings of stress. As I scrolled through my Facebook feed, I found myself in tears as I read about the events that had unfolded in the past 24 hours in Charlottesville, VA. I will spare the details of the horrifying things that have happened, especially because news is updating every hour, constantly unraveling new details. These events were full of hate related to a specific part of a person’s identity, race. With white supremacy rallies and counter protesters erupting in extreme violence over issues regarding race and the deep rooted racial history of our country, it was hard to know how to react beyond simply just severe frustration. This connected so well with something that I learned this past week in RA training in one of the sustained dialogue sessions. 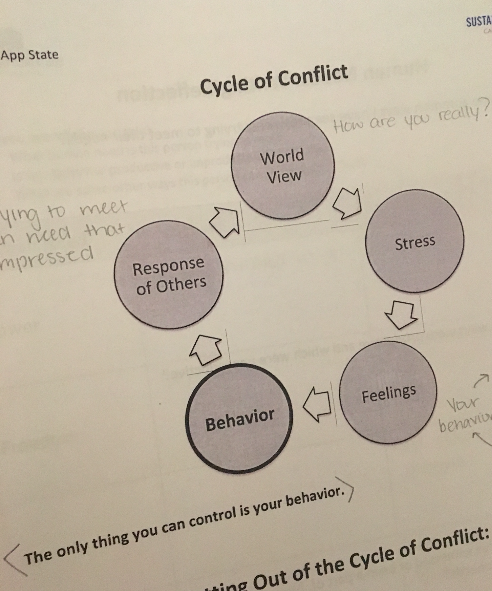 We learned about the “Cycle of Conflict” as seen below from my notes. Here you can see that ultimately, your world view helps to inform how you act within situations. I can’t control how I feel about things, which means it is totally valid for me to be frustrated, upset, and angry about these awful things happening within our country. I can’t control the response of others, or what others do, even if it is something as upsetting as maliciously hurting others. But what I can control, is my behavior, and my behavior moving forward from a devastating situation. Like my mom had said, I can’t change other people, but what this means is that I can do everything in my power to change my own behavior within this cycle to hopefully make an impact. So what can I do? Charlottesville, VA is home to the University of Virginia, which I’m sure has Resident Assistants figuring out how to deal with such extreme identity related catastrophes happening so close to home. What I can do is to continue to educate myself through the rest of RA training and beyond these two weeks so that I can best equip myself to teach these residents and others how to not only be valid in their own identity but to learn how to converse and be in community with people different from them, not only when it comes to race, but when it comes to all other aspects of identity. I may have been exhausted by putting up my bulletin boards today, but these boards can potentialy help to shape the interactions that future generations have regarding differences in beliefs so that maybe one day, we won’t come across these stories in our news feeds. So for now, rather than sitting in my frustration, I will turn that frustration into passion for education about identity, something I can control. My way of refusing to stay silent is through continued education within myself and others- in the hopes that somewhere along the line it makes a difference.